I was cleaning up the office and I found this crazy little guy. 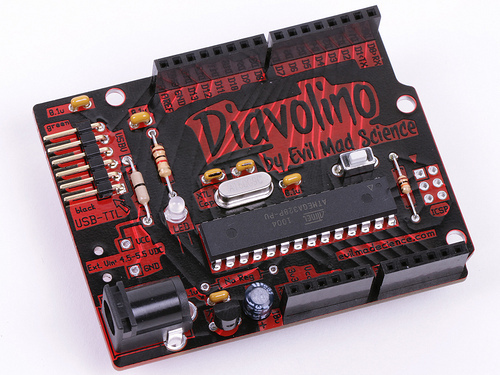 Despite the unique name - the Diavolino (translation: little devil) by Evil Mad Science is one sweet little piece of hardware if your up to the challenge of soldering everything together on your own and are looking for a very cost effective alternative to integrate an Arduino compatible board into your projects. It's a "bare-bones" solution that can be customized specifically to your needs - it has flames! It is effectively an Arduino UNO minus a USB connector (FTDI instead) no advanced power management (can be added), no 3.3V regulator which may affect usage of certain shields and the ICSP connector isn't positioned correctly - but heck, it is only $11.95 USD! Other alternatives are the Ardweeny from Solarbotics and the 5V Arduino Pro from SparkFun.